Oh man! When I heard there was a place opening in the North Market that was selling Belgian Waffles I was stoked. But when I heard they were going to have crepes, too…well I was practically apoplectic! I have been on a quest for the perfect crepe since I had one years ago. And I mean years ago. When I was a student at Ohio Dominican College (which is University now) I was student teaching with some really cool gals. They introduced me to great practical teaching methods, and a whole lot more. They would take me to really cool places I hadn’t been to before. One of these was a French restaurant that was in a big old house. I remember that the rooms were like separate dining rooms with only a few tables in each. Being young and not having much in the way of money, my experience with French restaurants at that point was little, if none. I remember I had the most incredible chicken and mushroom crepes with a white cream sauce. Those crepes made such an impression on me. They were everything that perfection should be. O.M.G. Ever since then I have been looking for a crepe experience that would transport me back to that French restaurant in 1977. Alas, I have not found it yet. Came close once when a friend of my sister’s made chicken crepes for her. They were quite incredible. But Julie wasn’t willing to share the recipe. Maybe someday she will…I will be a happy girl if that happens!!! But I digress. Back to Taste of Belgium. I took off for a Noon Time Travel. 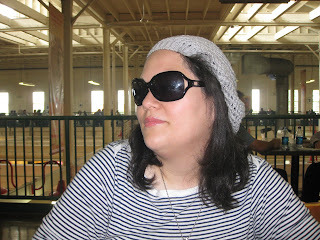 But when I entered the North Market looking for L3 I saw this very mysterious French woman. Who could this mademoiselle be? I hooked up with her and like two women on a mission we headed directly to the South end of the market. 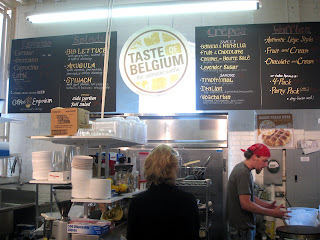 We had heard of a place called “Taste of Belgium”. 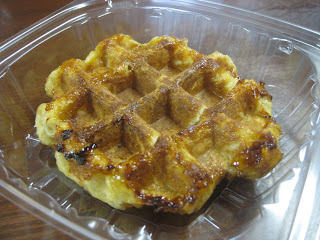 Could it be true that we could get wonderful waffles and crepes in Columbus, Ohio? Descending on them, we perused the menu. It all looked so good. Oh the decisions we had to make! What to order??? First some important details. The batter used for the crepes is a buckwheat batter with beer. Yeah! What’s not to like about that? The crepe batter is poured onto one of two crepe irons. This is beauty in motion. Once the batter is poured, the crepe maker (is there an official name for this person?) begins pushing the batter with a wooden tool. It is pushed around and out in a circular motion until the batter is evenly spread in a circle. Then the crepe maker cooks it to perfection; flips the crepe to cook the other side; pours on beaten egg and adds the rest of the ingredients. He/she then folds it over and there you have a perfectly made crepe. Then there are the waffles! Oh my, the waffles! It is so cool to watch these being made. The batter is nothing like we would think of waffle batter. It really is more of a dough with a wonderful vanilla flavor. The dough is made in Cincinnati and the owner brings it to the North Market. The waffle irons are really something to see. Each weighs 120 pounds! The ball of dough is dropped onto the iron and the iron is closed. It slowly presses the waffle down and cooks it. The result is an amazingly wonderful crisp crust that is sweet and oh so good! We knew it was our civic duty to try some of both the sweet and savory items. There was no way we could not! Why, we’d be letting all of you down. We resigned ourselves to the fact that this was our destiny. We soldiered on! Ze mysterious French woman ordered a Traditional crepe. 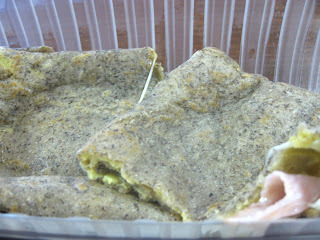 This crepe begins with the buckwheat batter and adds egg, ham and Gruyere cheese. She also requested a waffle. I stepped up and selected the Italian crepe and the caramel au beurre salé. 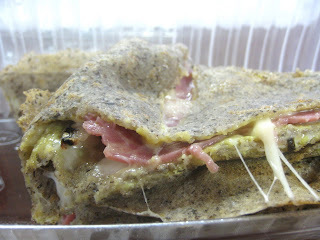 The Italian crepe is the buckwheat batter with egg, mozzarella cheese, provolone cheese and cappicola ham. 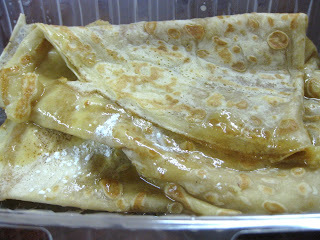 The caramel au beurre salé crepe is a sweet crepe with a slightly salty caramel. The coffee machine was out for repairs so we were unable to taste any of the java offerings. We took our treasures up to the top level of the market and situated ourselves with our feast. And a feast it was! The traditional crepe was delicious! Of the crepes, this was my favorite. (But keep in mind there are so many others we have yet to try!) The Gruyere cheese absolutely made this crepe! It literally made the egg and ham sing! It was wonderful! The Italian crepe was also good. In my humble opinion, the cappicola overpowered the mild mozzarella and provolone cheeses a bit. Nevertheless, I would have had to slap someone’s hand if they had tried to take it away from me! The caramel au beurre salé was also very good. I prefer this style of crepe because, well, we all know that I have 32 “sweet tooths”! 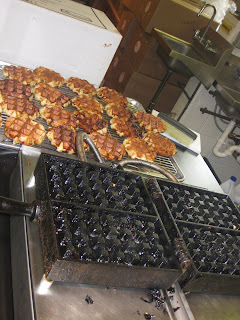 However, the pièce de résistance was the waffle. Wow! Wow! Wow! It was amazing! I don’t even know how to begin to describe this to you! I think I had “a moment” when I bit into this. It was nirvana. It was utopia. It was sheer heaven! Yeah, I liked it okay. And wait! What was that I saw? Through the haze I believe I saw a hint of a smile on Ze mysterious French woman’s face. It was that good. As for my quest for those chicken and mushroom crepes? I'm still looking. 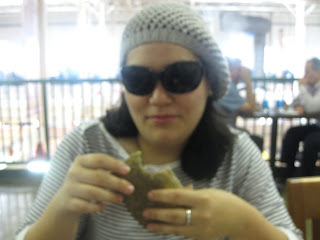 But I simply cannot stop thinking about getting back to the North Market for another waffle…or maybe waffles! La crepe avec oeuf, jambon, et fromage c'est tres bon! 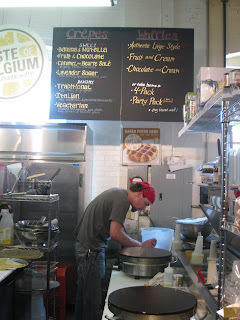 Je suis adore la creparie a North Market, mais je voudrais une cafe froid avec mon crepe.